With a funky, jazzy sound there’s no ordinary way to describe Laura Cheadle. You could say “coffee shop folksy,” but that wouldn’t cover the hip chords. You could say “jazz singer,” but that wouldn’t include the soul lyrics. So, let’s throw it all in the same pot, simmer it, and say you’ve got a hot and enigmatic treat awaiting your enjoyment. AX: Tell me about your background in music. LC: I have been around music my entire life. My father is an amazing and accomplished jazz musician who has influenced me in so many ways. I started singing and playing the piano at the age of five. I actually wrote my first song at the age of eight. By 11 years old, I started playing drums and singing while writing songs with my brothers, who also play instruments. We started a band called “Sibling” which was very much in the pop idiom. We performed at many shows together until I was about 16. At 16, I picked up the guitar and taught myself how to play. I started writing deeper songs and my sound went from pop to soul, pop, rock. AX: How do you go about coming up with material? What’s your creative process? LC: Sometimes I wake up in the middle of the night with lyrics in my head and I write them down. Usually the music comes to me first. I tend to write all my music (in the form of chords) on the guitar and let the lyrics flow. My father, who is also my producer, says since I have taught myself to play the guitar, I have come up with some very unique ways to play chords. He thinks this is why my songs have a different sound to them. I have been listening to rock, blues, jazz and various forms of R&B and soul since I was born. These eclectic genres are reflected in what I write. AX: How would you describe your performances? What type of expression is it? LC: My performances are always high-energy fun. I never just sit there on my stool. I give a full performance. My band is made up of extremely talented and seasoned musicians. My father and brother are also members of the band. We have been playing together for our entire lives, so our sound is very tightly knit. When I am playing with my entire band, the songs have a very soulful, jazzy and funky feel. 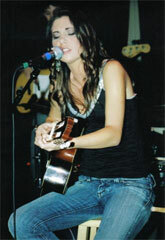 In addition, I like to mix up the set with acoustic songs, full band songs, and piano songs. From time to time, I also perform just acoustic shows, which allows me to explore the more intimate sides of myself. Some people prefer the more up-front and personal performances that a solo acoustic show provides. AX: How long have you been on the local circuit? LC: I have been on the local circuit since I was about 16 years old, mainly playing coffee houses with just me and the guitar. For the past year and a half, I have been performing with my band, as well. I just released my new CD with the band called “Falling In.” We had a wonderful response at our CD release party held at the World Café Live in Philadelphia this past February. AX: What do you consider the best parts of doing what you do? LC: I love to look out into the audience while performing and seeing people in the crowd singing along with me. That really lets me know that people are truly affected by my music. I love to see the audience getting into the vibe and really moving with the music. AX: What are the most difficult or challenging? LC: It was quite challenging when we played the House of Blues in Atlantic City for a Battle of the Bands show. All the bands competing besides us were heavy metal and/or punk. (Just take a listen to any one of my songs and you’ll know that my sound definitely doesn’t fit that description!) I was also the only female performer at the show. It was really difficult going out on to that stage and knowing it wasn’t my type of audience. By the end of the set, however, the whole place was rocking along with us and I made several new fans. Even though this experience was difficult, I decided to push through it and everything worked out great! AX: What do you feel sets you apart from others in the area artists? LC: Many singer-songwriters in my area are heavily folk-influenced. They kind of follow in Jewel/Tori Amos footsteps. I am different because, although I am really not folk-influenced, my music is well-received in a coffee house environment. My music translates very nicely in different venues. I am influenced by a wide range of artists from Stevie Wonder to John Mayer, with a little Etta James thrown in. AX: Do you have a fan base? LC: Oh I have a fantastic fan base! At my show last month at the Milk Boy in Ardmore, Pa, a bunch of my fans brought me Easter baskets because I wrote a blog on Myspace on Easter about not receiving Easter candy. Their thoughtfulness made my day! Many of the fans sing along to my songs and it just absolutely fills me with joy. It’s so gratifying after pouring your heart and soul into a song and having people really identify with it. AX: Why do you do what you do? Is there anything that you want fans to take from your music? LC: Music is my passion. I do it because I love and need to. Music is how I express myself. I want my fans to become my friends and really understand me through my music. AX: Where are you scheduled to perform in the near future? LC: My Tin Angel Show is Saturday May 27, at 10:30. Also, I am in the process of booking a full tour and many more shows for those months. I hope people will keep checking my web site for the latest updates. As of right now, I am performing on June 2nd at Barrington Coffee House in Barrington, NJ for a Philly locals showcase and on June 9th at Double Shots Espresso Bar in Old City Philadelphia located on 211 Chestnut St. At 7:30PM with my band. Currently in the works are gigs at Maxwell’s in Hoboken and The Baggot Inn in NYC, both of which will be scheduled for either late June or early mid-July. 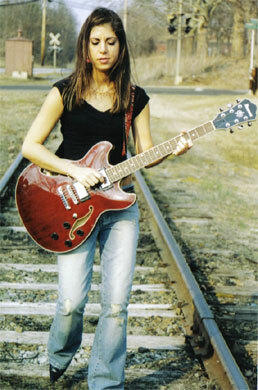 For more information on Laura Cheadle and her music visit, www.LauraCheadle.com.